I've always loved 3D images, movies, etc. Have been making them (Mostly anaglyphs) for years. 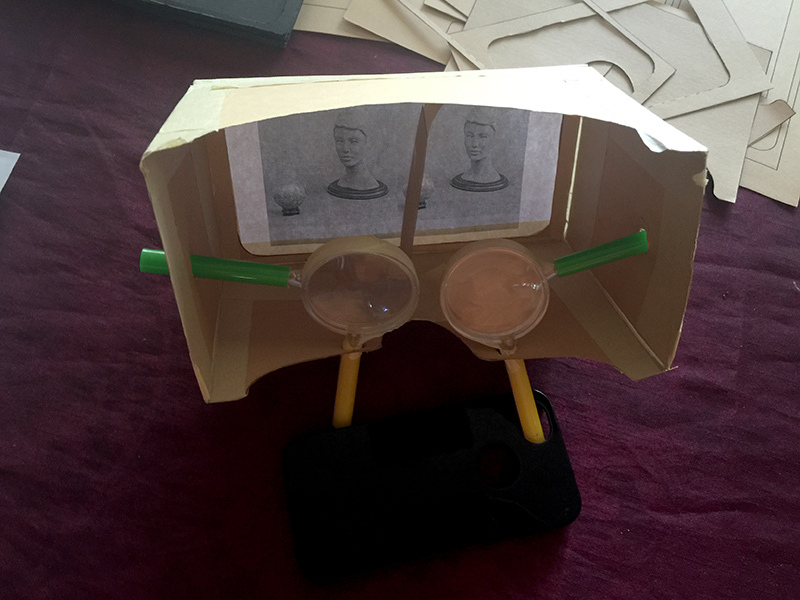 Decided to take a stab at making a "VR Headset." So, this was my first prototype. 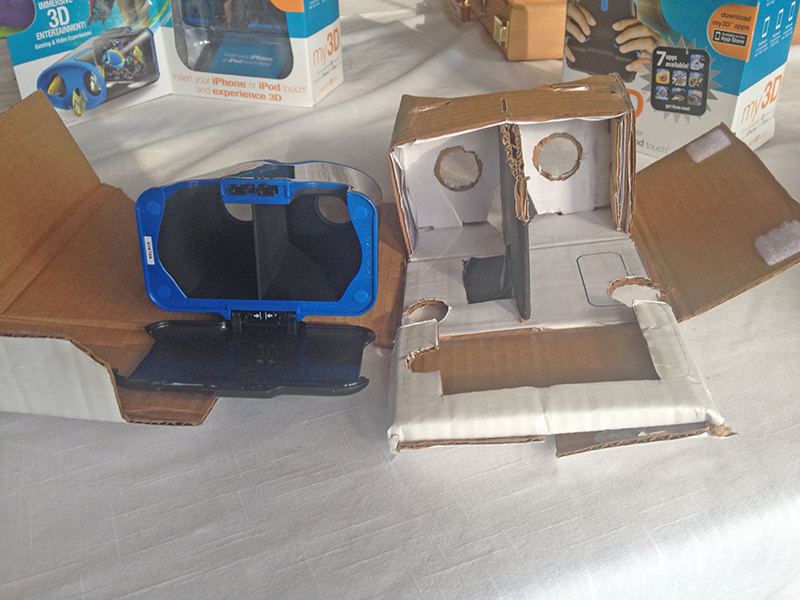 Started out with Google's "Cardboard" design, which they made for Android. 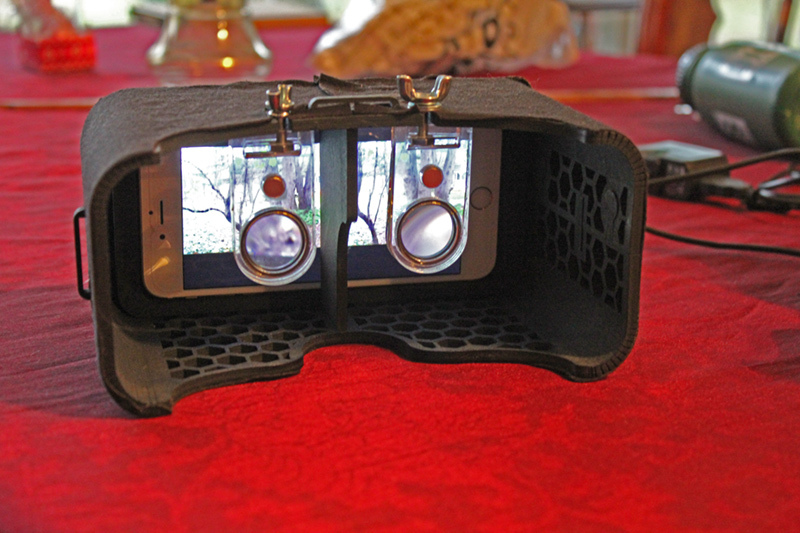 Then modified it to work with my iPhone 5 and the lenses I had on hand. Below is the result. 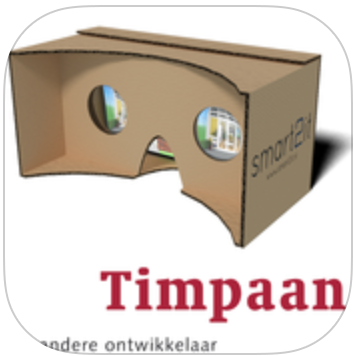 Found a couple VR apps and tried it out.Worked way better than I expected. 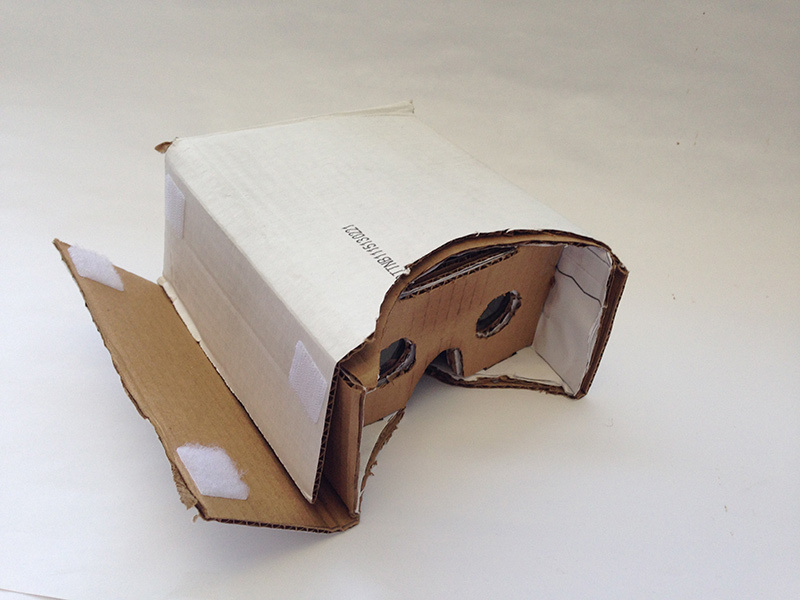 This is Google's Cardboard. They are much better at cutting than I am. And this is what mine looks like all put together. 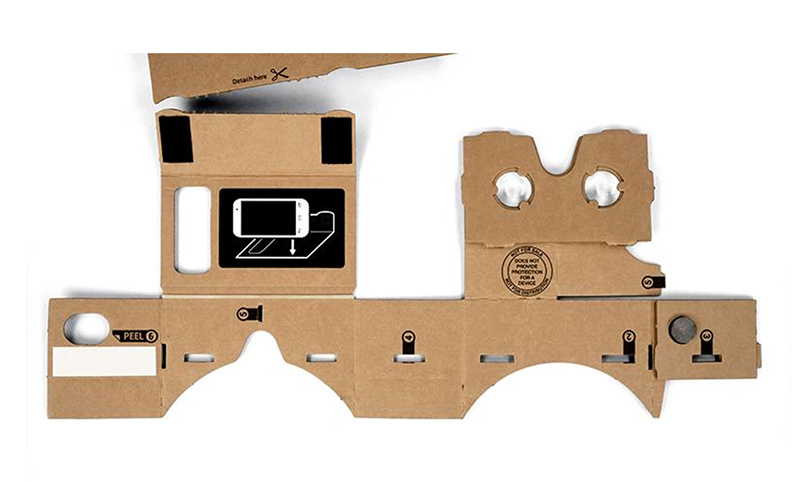 Thinner cardboard would have been better. This was the thinnest I had, from a case of paper. Held closed with two tabs of Vecro® tape. Opened up, you can see where the phone goes and a second pair of Vecro® tabs. And with the phone compartment laid flat you can slide the phone in. Full size tracing of the prototype. 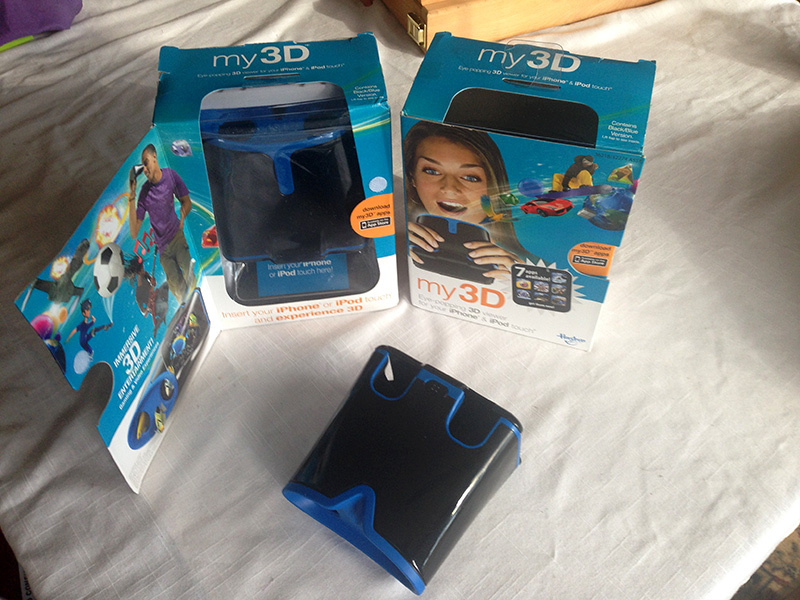 Picked up a couple of Hasbro's (discontinued) My3D iPhone/iPodTouch "3D Viewers" (their term). 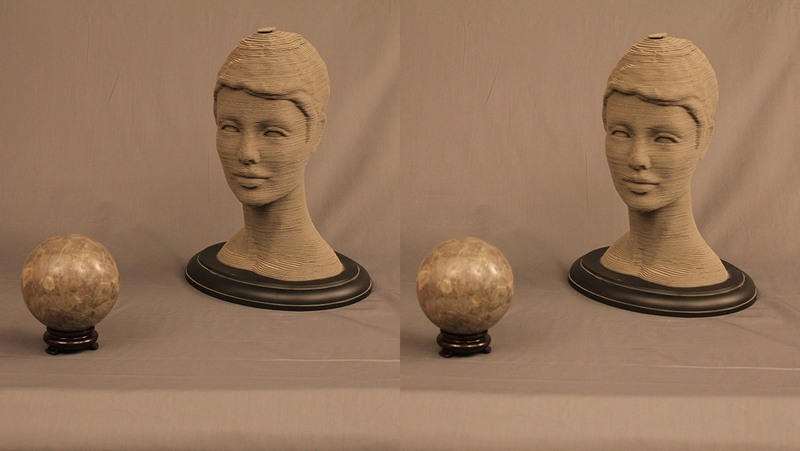 One as a source of lenses for next prototype, and the other as a reference unit. (Even though there are some flaws in their design). Turned out that lenses were too difficult to remove. They solved the control issue in the same way I did by putting finger (or in their instructions thumb) holes in the bottom. Their design is for children, so the nose slot is small and not very comfortable or effective at sealing out light for adults. I was a little disappointed that the focal length is not much shorter than mine. Got this prototype far enough along to learn from it without completing it. Based this design on a pair of safety goggles. Better lenses (stolen from a pair of binoculars) with shorter focal length (about 3 1/4 inches) meant smaller design and better field of view in early tests. However my sandwich lens mounting diminished this as I cut the outer layer holes too small and wasted too much of the lens. Need to re-think that design. 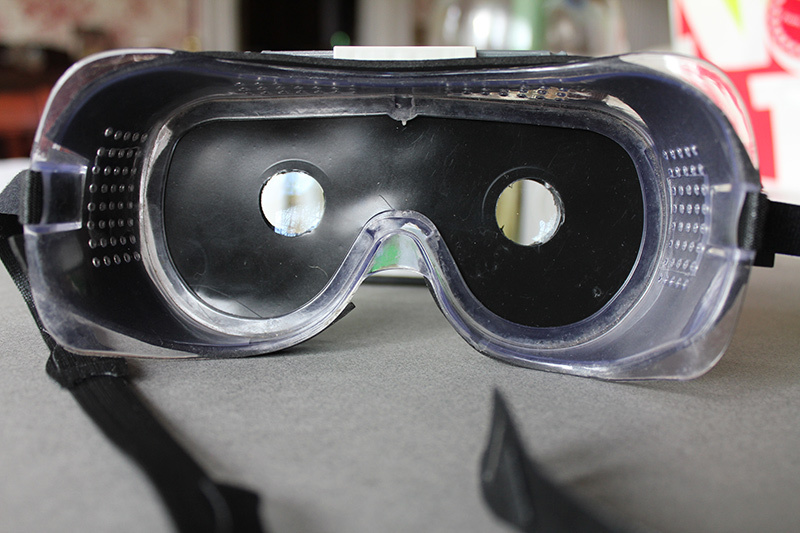 (Lenses sit in just-right sized holes in foam core and are sandwiched by black plastic from plate which fit goggles and craft foam.) KNEX mounting of phone showed promise, though sagged in this prototype. 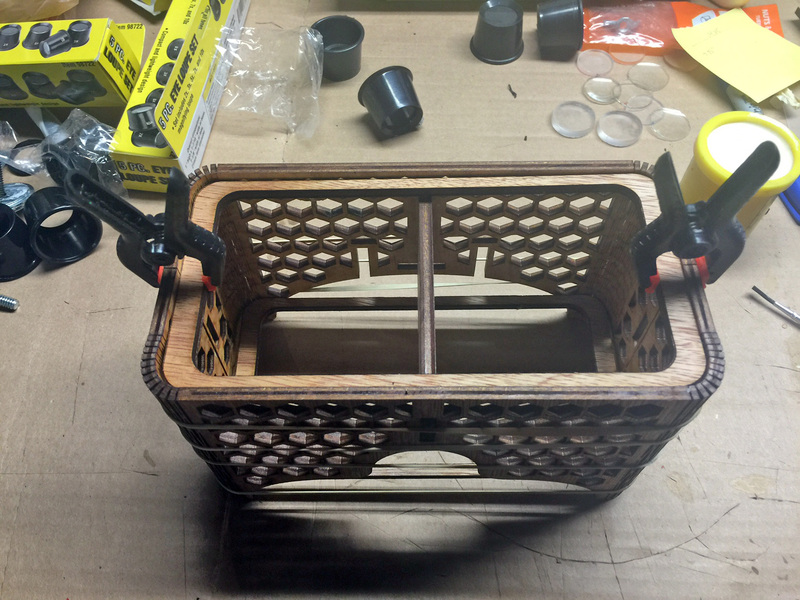 I know it needs a more rigid frame, but again I decided not to expend more effort on this particular prototype. I started thinking that ski goggles might be a better starting point than safety goggles. But this sort of safety goggles can be purchased for about $1 apiece when on sale. 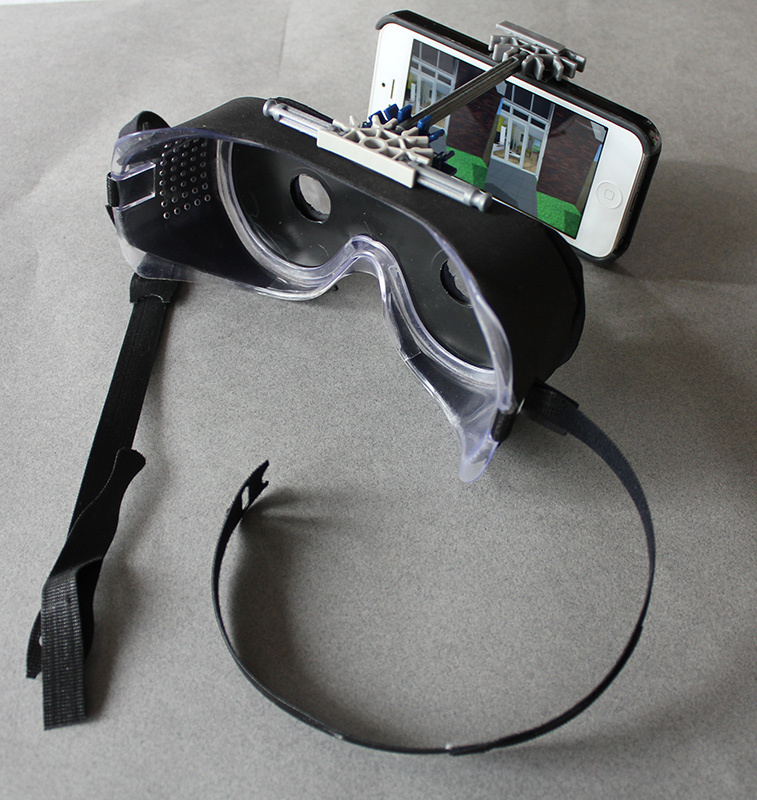 First step was removing the lens from the goggles, which is straightforward. I ended up not using a lot from this design in my next prototype, but one of the things I did cary over was the use of some materials. 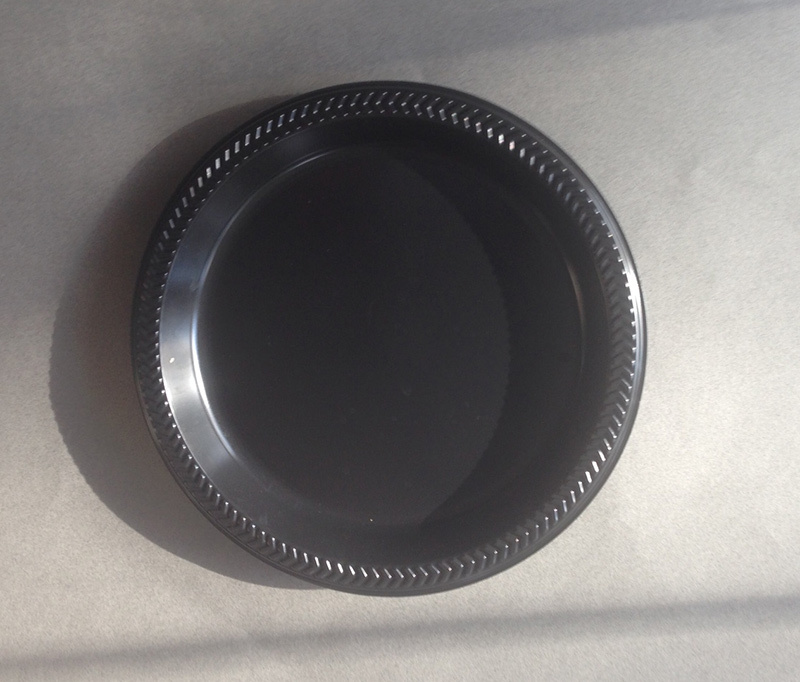 Shown in this photo thin plastic disposable dinner plates. 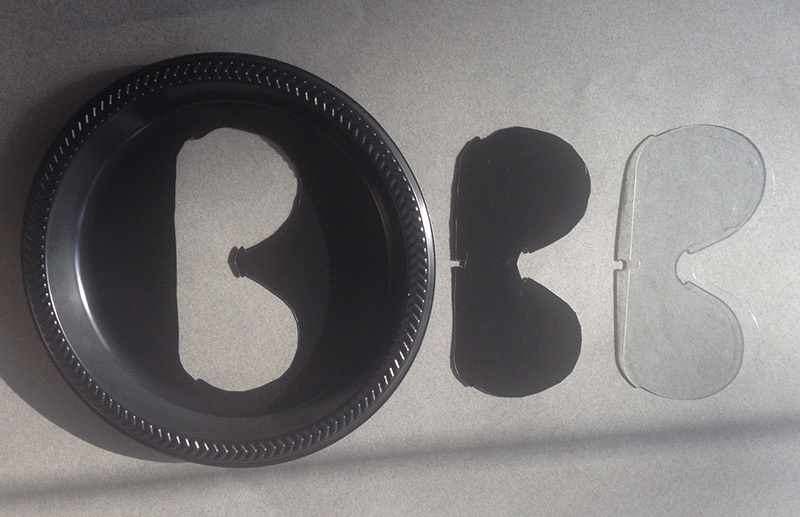 Here I cut a light-blocking replacement for the safety lens from the plastic plate. 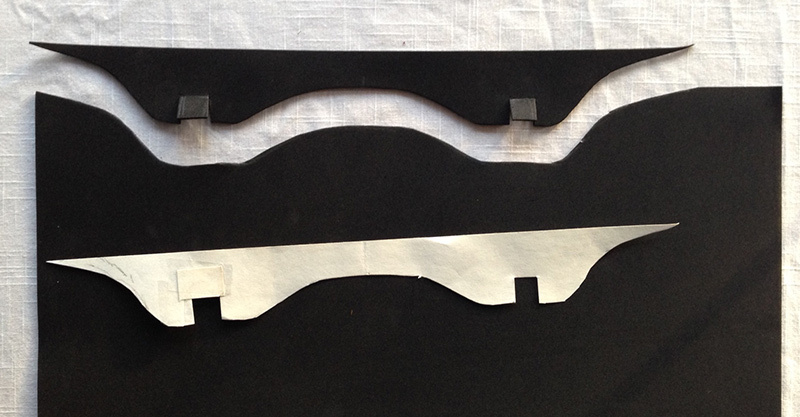 I used black craft foam to create a shroud to cover clear goggles frame and block light. 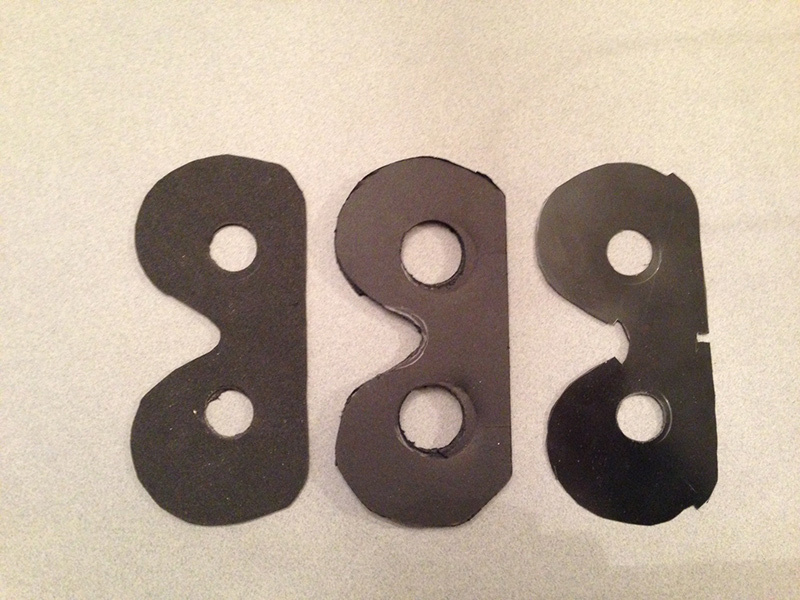 This material proved very useful and I used it a good bit in the next prototype. 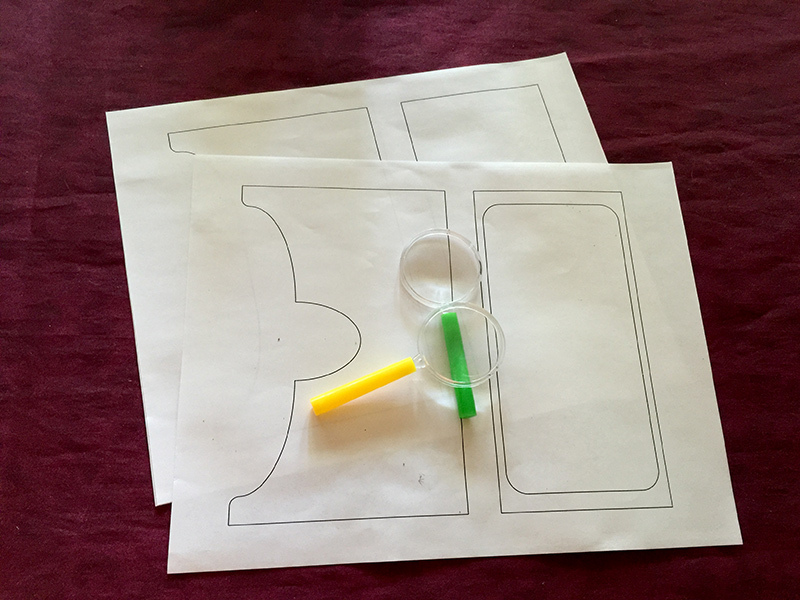 Components cut from plastic dinner plate and foam core to match the front shape of the safety goggles. 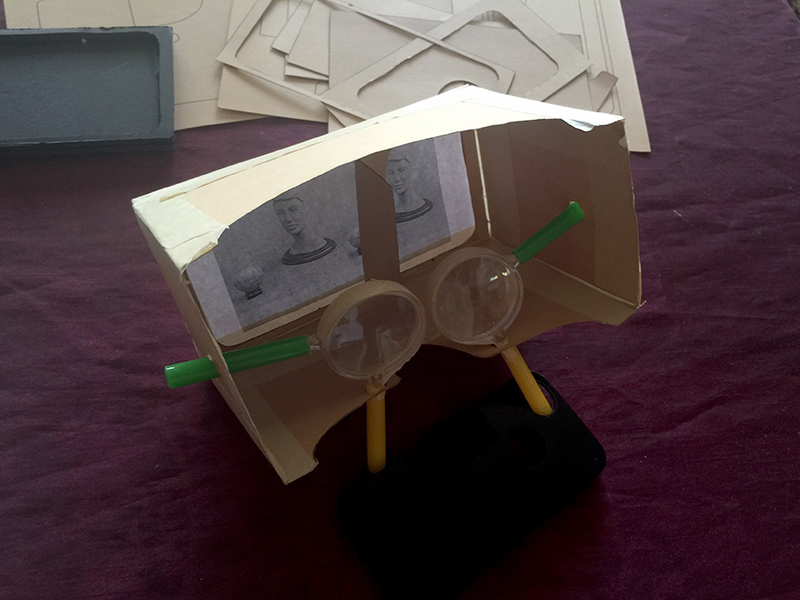 Thin plastic, foam core, and craft foam with lens holes. Lens sandwich. Foamcore in the middle, thin plastic (cut from disposable plate) on top, craft foam on bottom. 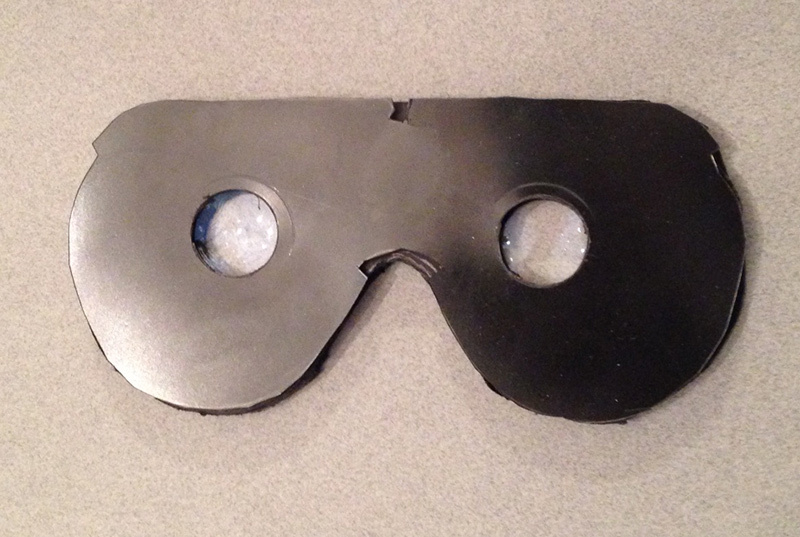 Thin plastic was cut to fit as replacement for goggles' original lens. Lens sandwich assembled into safety goggles. Assembled goggles. KNEX pieces attached to goggles with clear double-face mounting tape. Did not finish, but would have stiffened up phone support with additional KNEX struts. Also would have added craft foam surround to block light. Another thing carried over from this design was the shape of where the goggles meet the face. Looking into the goggles it is easier to see that the lens openings were too small. Even in the next design I think the lenses are not big enough. This model has straps so that it can be used hands-free. Lenses can be positioned to adjust focus and inter-ocular distance. Not perfect, but definite progress. Hex nuts, machine screws, and 2 pairs of magnets were eventually replaced with 3D printed lens mounts employing 4 rare earth magnets for each lens. Main panels cut from foam core. 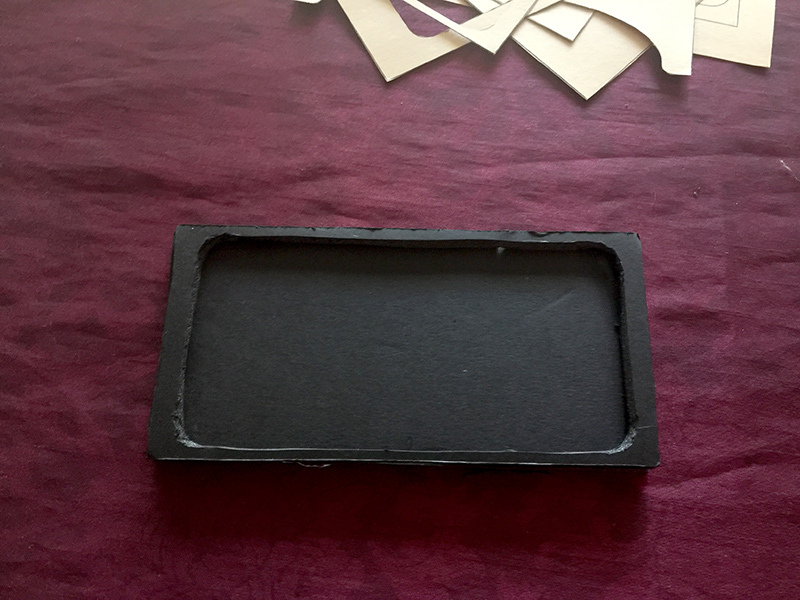 The holes are not eye holes, they are in the bottom (and were later enlarged) to accommodate magnetic lens mounts (through thin plastic laminated to the foam core). 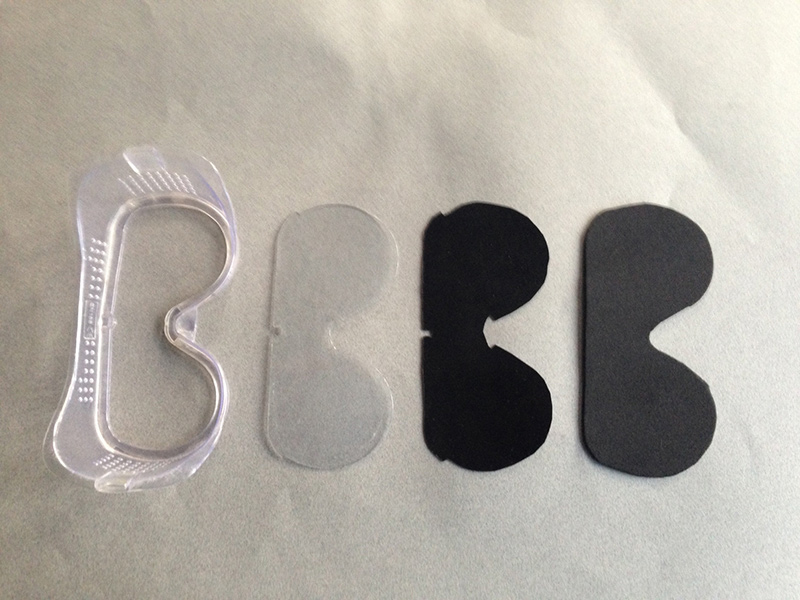 Cut from a disposable plate, this sheet of plastic is thin enough for two magnets to adhere through and hold the lenses in an adjustable manner. 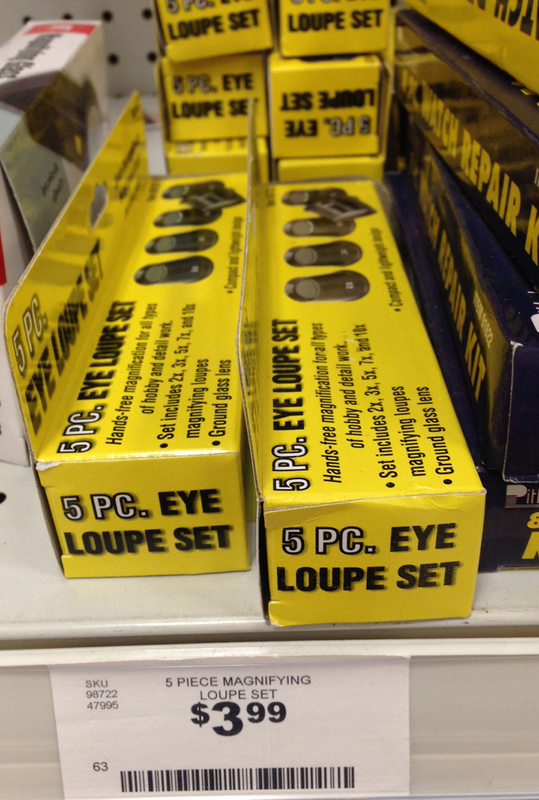 Inexpensive loupes at Harbor Freight. 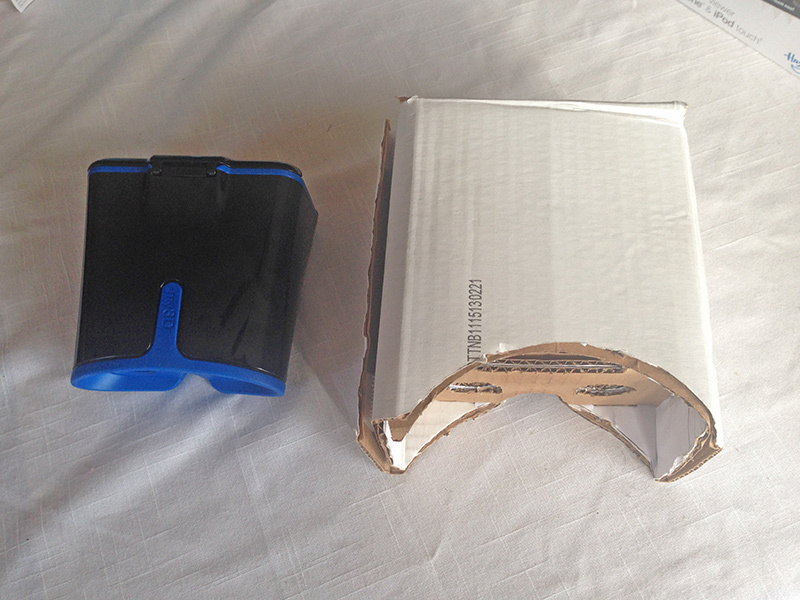 I used the 10x loupes (one from each of two packages) for greatest magnification and so shortest goggles. 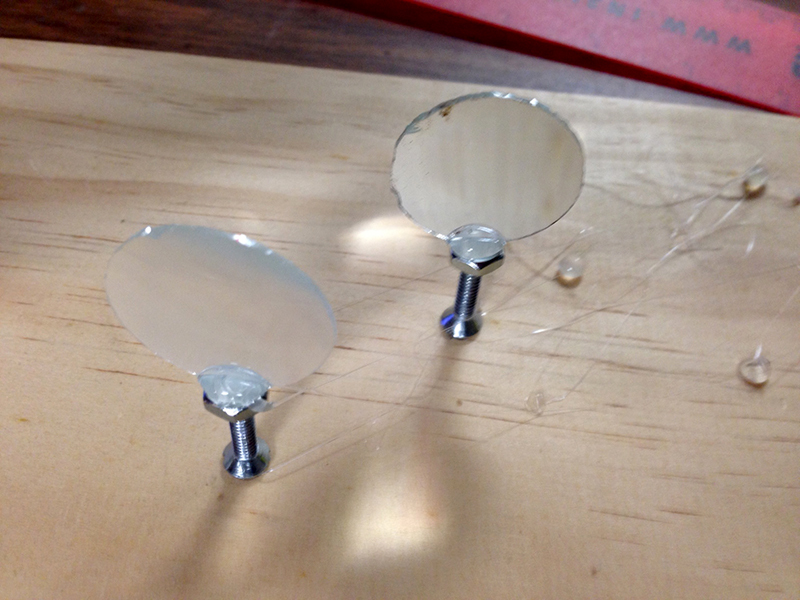 Lenses removed from loupes and hot glued to 6-32 hex nuts. Super glue was applied to the 6-32 x 3/4 flat head machine screw threads to keep them from twisting once attached to the nuts. 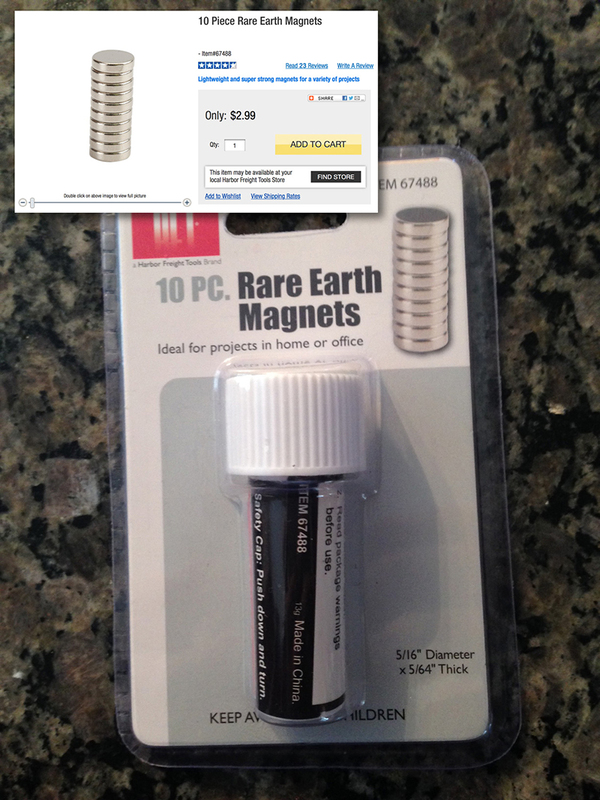 One magnet was then superglued to each screw head. Completely unfolded. Hinges are made from 2 layers of duck tape. Full width tape to attach pieces of foam core together with a foam cire thickness gap between them, and a thin strip of ducktape to cover the adhesive side of the full width tape in the gap. Goggles folded, head straps loose. Head straps are cut from craft foam, as is the rounded triangle portion where they attach at the base of the wearer's skull. Head straps attached with Velcro - adjustable. The three strap design seems to comfortably distribute the weight effectively, though unit has not been tested for long periods of wear yet. I am still not very happy with the optics. Picked up a couple of these to experiment with. They are better lenses and have some mounting hardware that might be adaptable. But of course different lenses mean different distance to phone, etc. so more testing/prototyping to come. Here are the magnets I used. So strong they come in a child-proof bottle with a warning about dangers of them being swallowed. Also, the magnets are quite brittle so you have to be careful not to let them snap together. New, improved lens mounts. 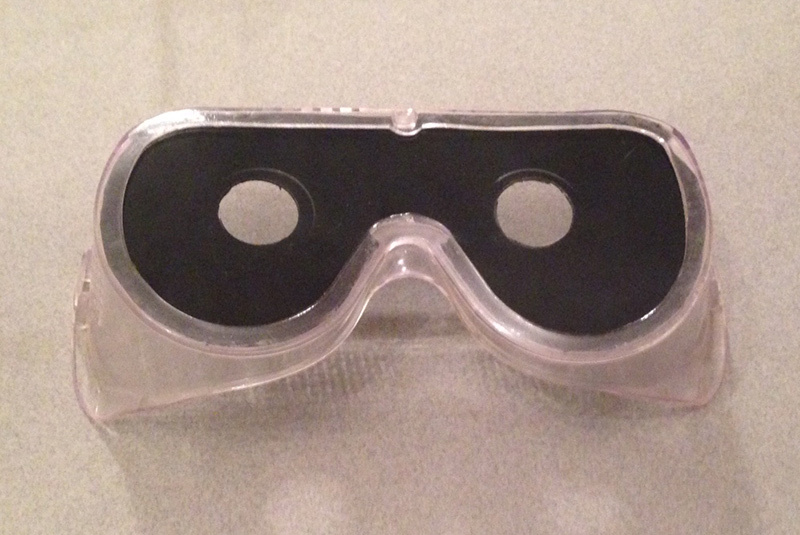 4 rare earth magnets per lens (instead of 2 in previous design) make it much easier to adjust focus while wearing the goggles. More foam core and hot glue. I'm thinking these might be candidates for 3D printing. 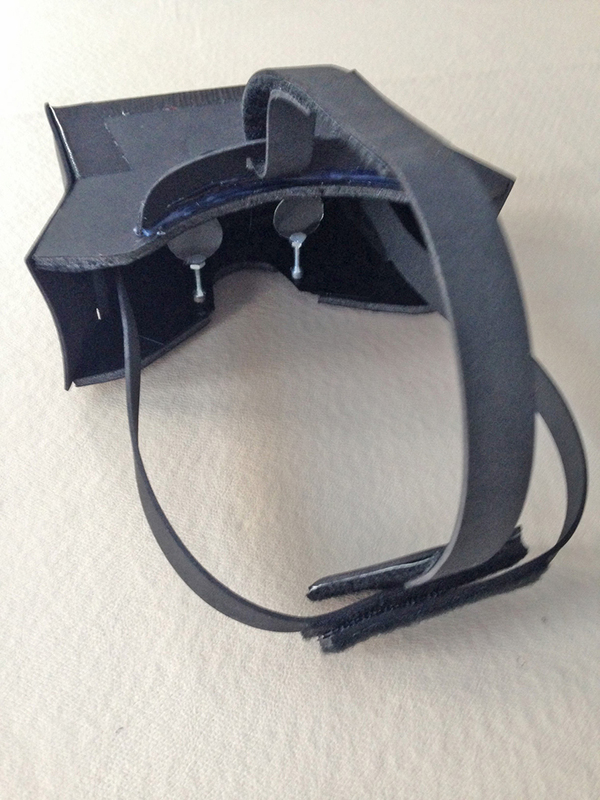 New lens mounts CADed and 3D printed by my son (MCET major). The magnet holes were a tiny bit small, so I had to widen them a bit. Superglued the magnets and lenses in place. The plan was to print them with black material, but that didn't happen. I probably should have painted them black before gluing the lenses on. Lens mounts in the headset. RIT charged $11.40 to print the 4 components. I suspect that labor was the major contributor to that cost. They work! Also tested with wife's new iPhone 6. Bigger screen and black phone is better. 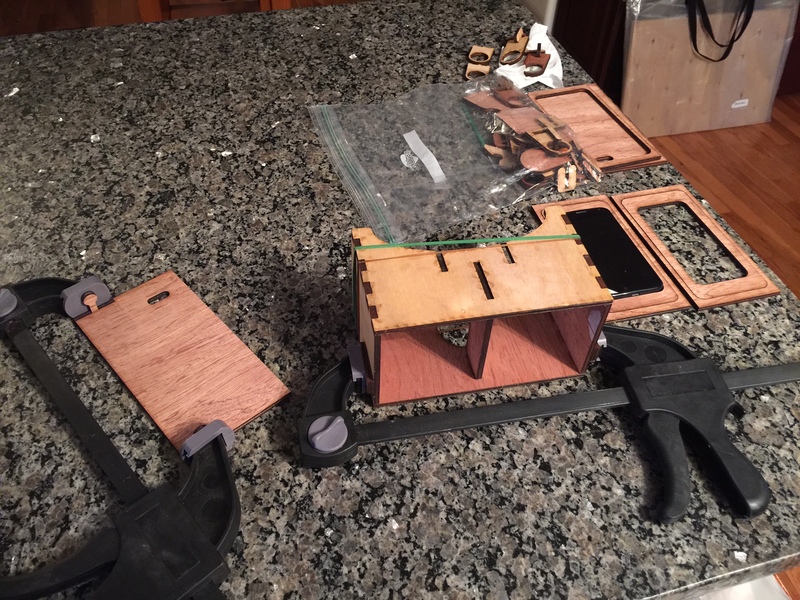 I decided to build a device to assist in testing various lens configurations without having to design and build a new prototype for each configuration like we've been doing. 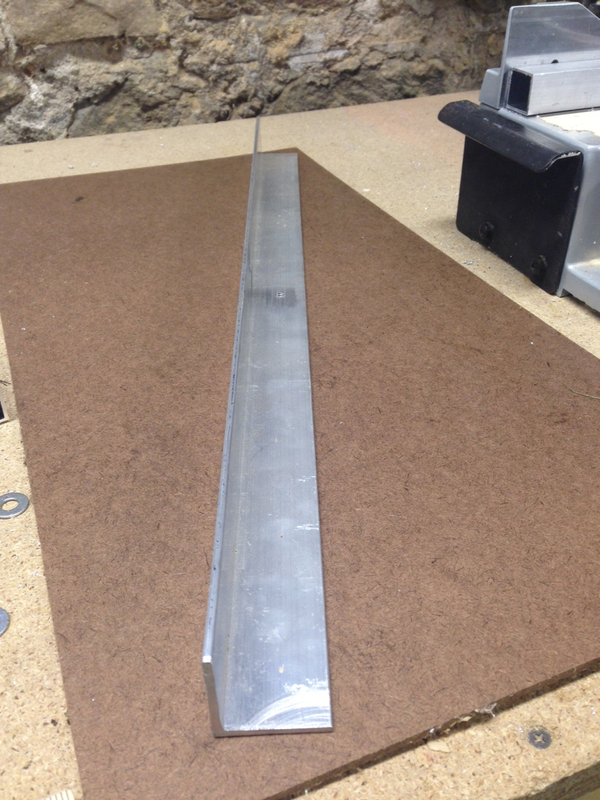 I began by cutting a 24 inch length of angle aluminum as the bench rail. I drilled and tapped the center to allow mounting on a tripod. 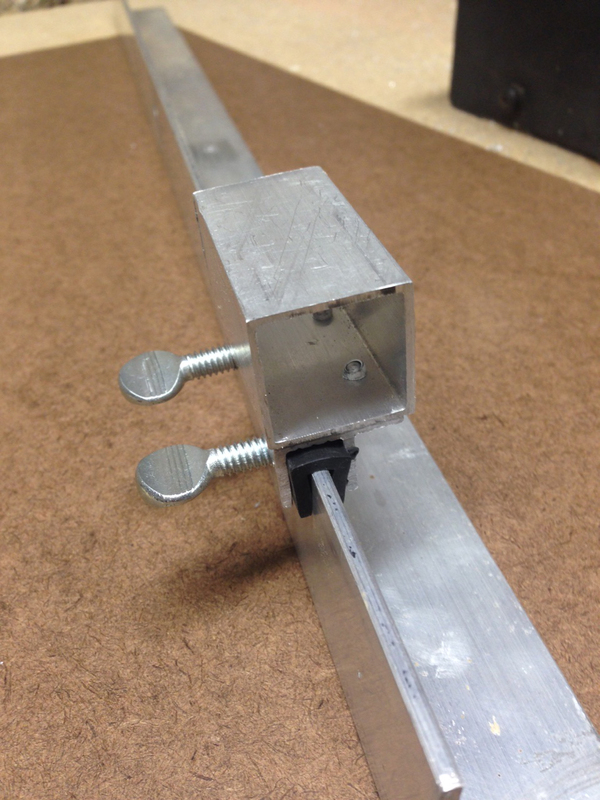 This saved me the need to build a stand for the optical bench. 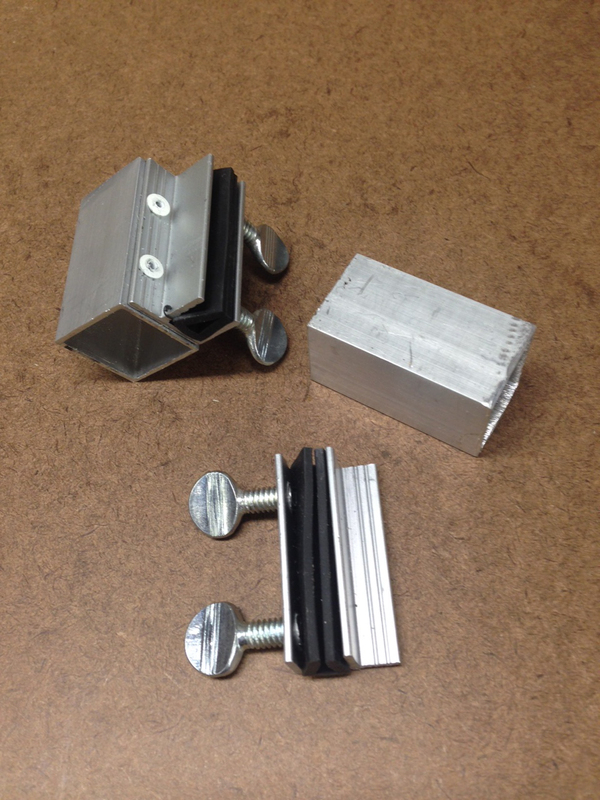 Riveted lengths of aluminum box to window stops I had in my workshop. 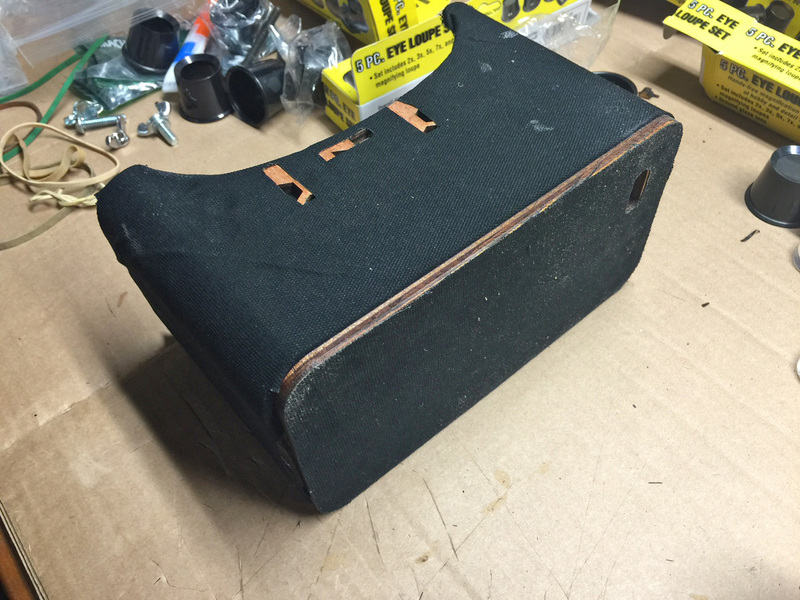 The stops have a groove, rubber groove liner, and set screws. These will ride on the bench rail. 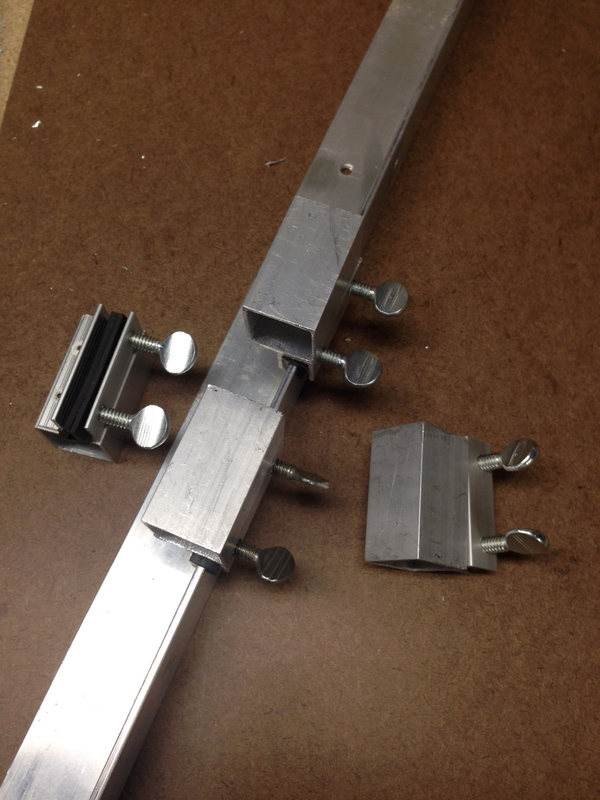 I ended up cutting one of these assemblies in half to make a couple of shorter rail mounts. Here's a rail mount on the rail. A couple rail mounts on the rail, a couple off to the side. The optical bench assembled for a test. 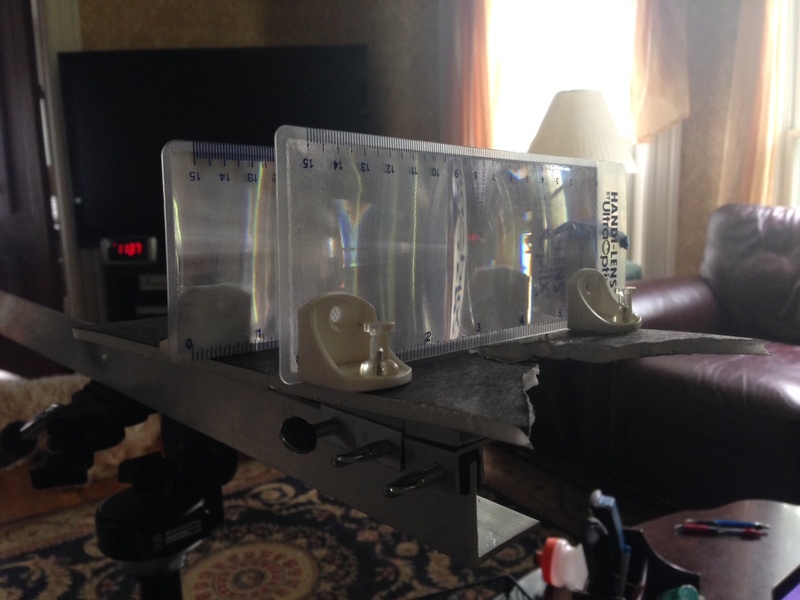 Platforms of foam core are attached to rail mounts with double-faced tape. A few changes for this version… First, I upgraded my phone to an iPhone 6 plus a few months ago, so the design has been modified to accompany the (much) larger phone/screen. Second, I think I found a new source of lenses that will work. Trying to determine if it is a reliable source. Lenses are not great, but they are large enough and inexpensive. Tradeoffs. 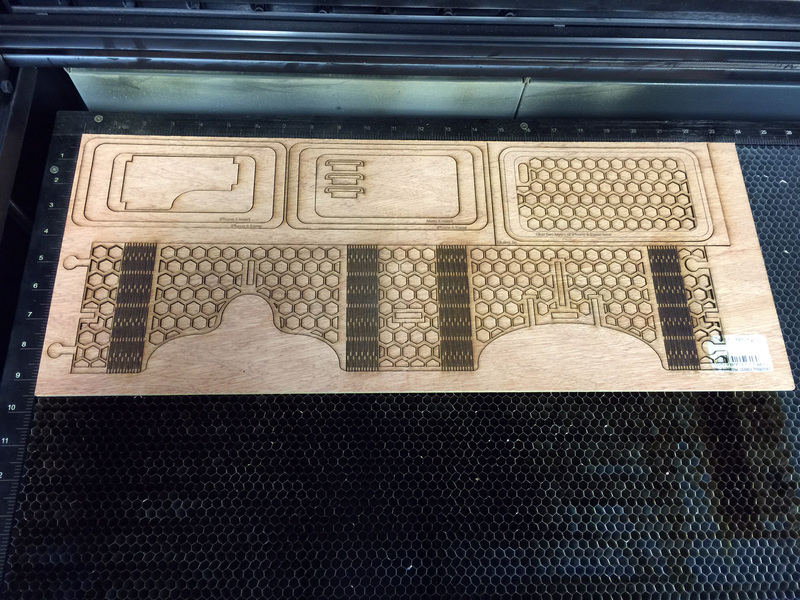 Finally, a colleague has acquired a laser cutter, so I'm developing SVG drawings for the cutter. This will make production faster and easier, and plans which are sharable (both original goals of the project). Not quite CAD, just a simple vector drawing program. But hopefully good enough for laser cutting. Test prints of drawings, along with new lenses. Once I confirm that these can be obtained reasonably reliably I'll post more information. Plans printed on card stock. 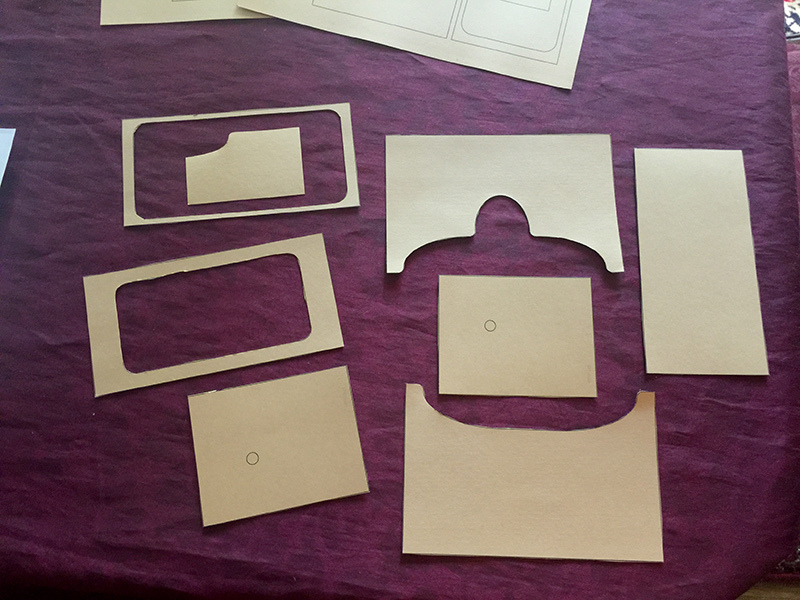 Card stock plans cut out for prototyping/testing for fit, etc. Foam core hand cut from templates and glued to test phone holder. Assembled for testing. 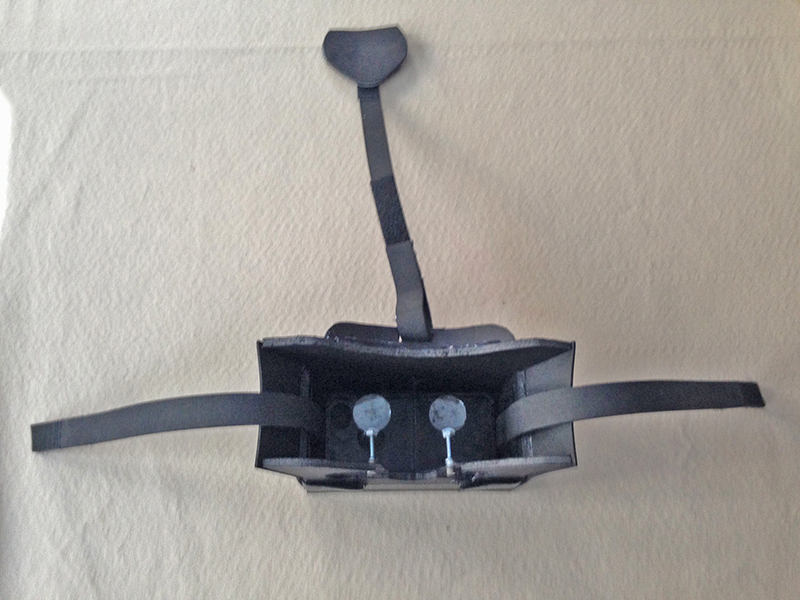 Each eye requires two lenses, taped together here. In use we'll probably glue them together with cyanoacrylate. 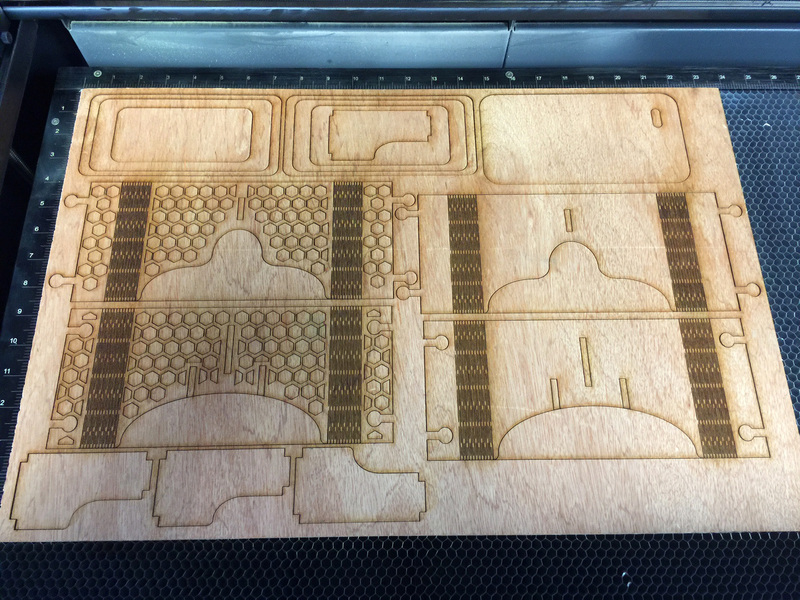 Thanks to the generosity of my colleague Daniel Ashbrook I now have access to his LASER cutter. It's a truly amazing piece of technology. The only downside so far is that it can not cut foam core without igniting it (or so I have been warned). Dan's grad students are working on setting up a small CNC routing machine which should be able to do foam core, but the speed and precision of the LASER cutter are too good to resist. 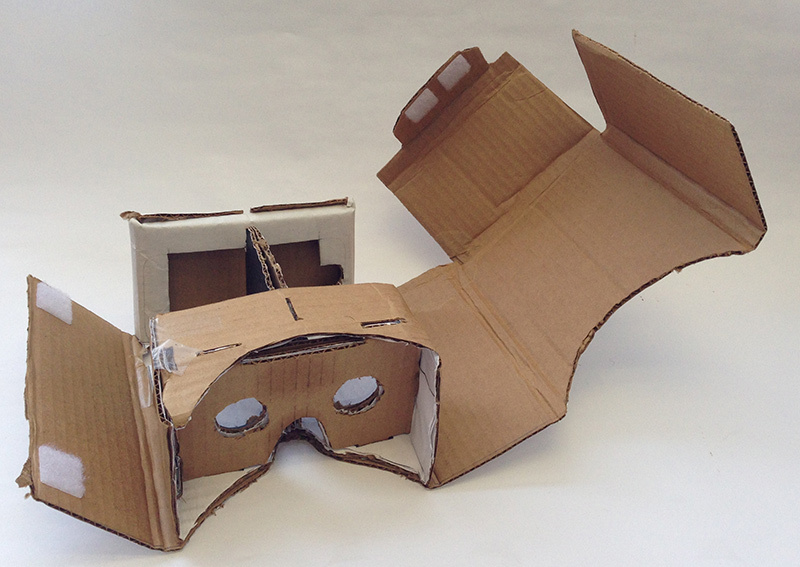 So today I experimented with cardboard and plywood. The cutter uses a 60 watt CO2 10.6μ LASER head. 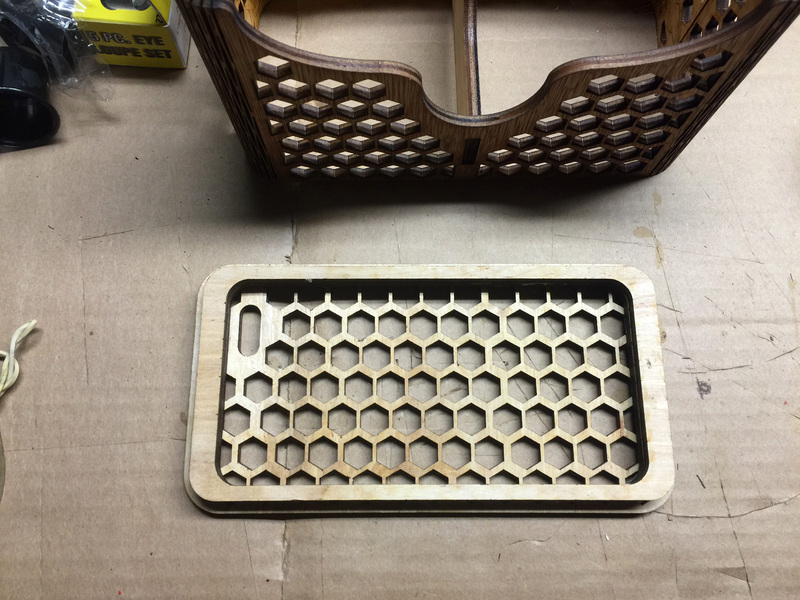 I've started a page to keep track of materials and LASER cutter settings. 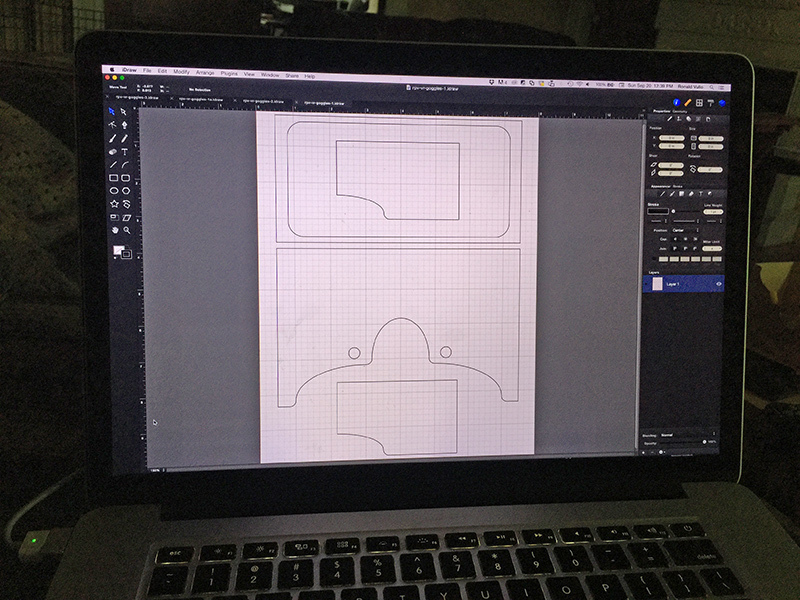 My simple little drawing program (iDraw, aka Autodesk Graphic which I do like) doesn't work for the LASER cutter, so my plans are now drawn in Adobe Illustrator. (LASER cutter drivers are only available for Windows and strokes need to be set to .001 inch for LASER vector cutting.) 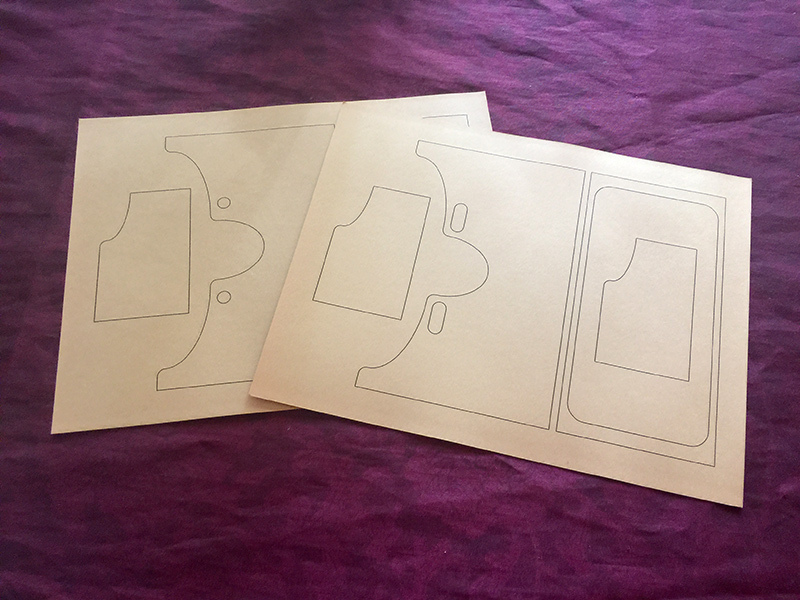 In addition to parts for the goggles, I also did some experiments with etching and cutting "living hinges" and a design I came up with for a more traditional hinged joint. 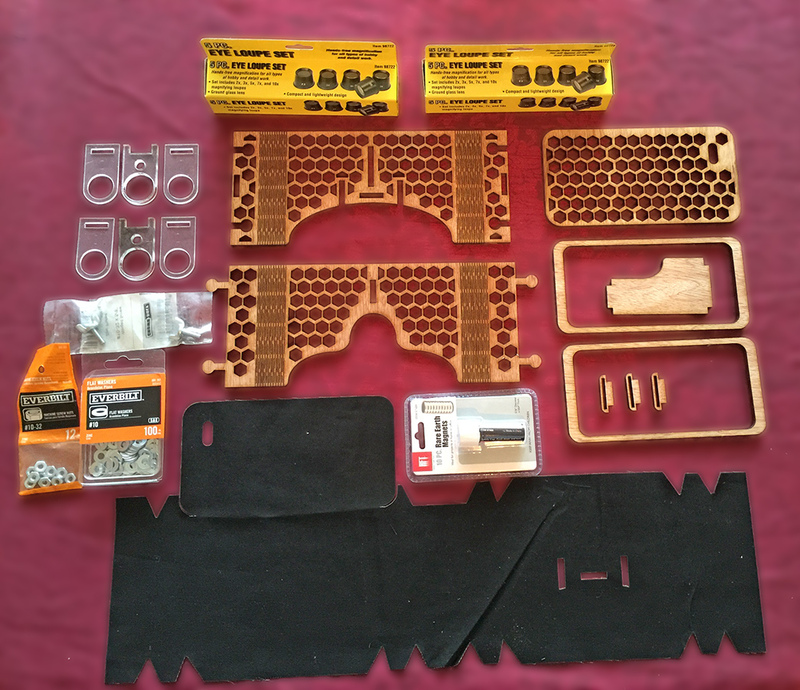 The trick here is that everything must be cut from and assembled from flat pieces. Two of these lenses taped together proved effective, however the source (Dollar Tree) was unreliable. When I went back (to every store within reasonable driving distance, and their web site) I was unable to find them again. I found another online source at twice the price but decided to try something else instead. I previously used the 10x loupes (one from each of two packages) from Harbor Freight. Combining Dollar Tree lenses to make a compound lens clued me in to the possibilities that opens up, so as I experiment with LASER cut parts, which will be faster and easier to produce it should make it easier for me to experiment with building compound lenses from the loupes. Since these lenses are glass and of much higher quality than the party favors, and the price differential disappeared along with Dollar Tree's stock, it made sense to try these again. The LASER cutter, air filter, and workstation. 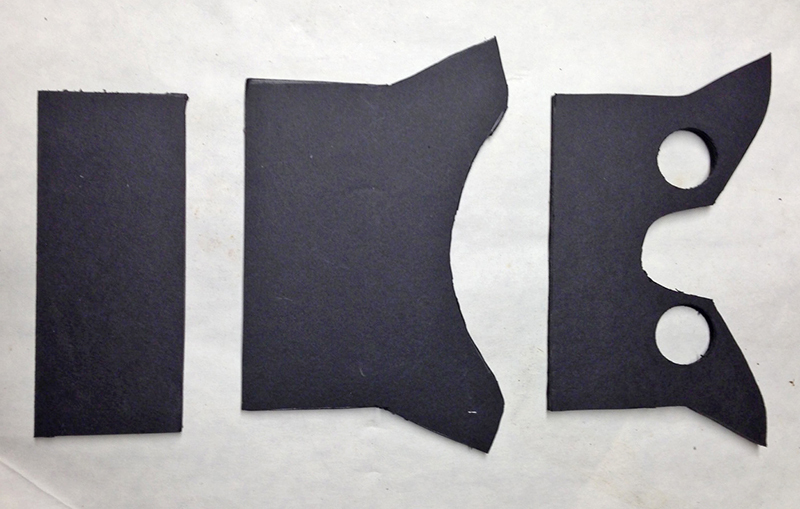 Cutting out cardboard test of design. In addition to cutting vector shapes out of the material, the LASER can also be used to etch raster images into the material. As a test I etched a photo of my daughter posing with R2D2. Cutting out plywood test of design. 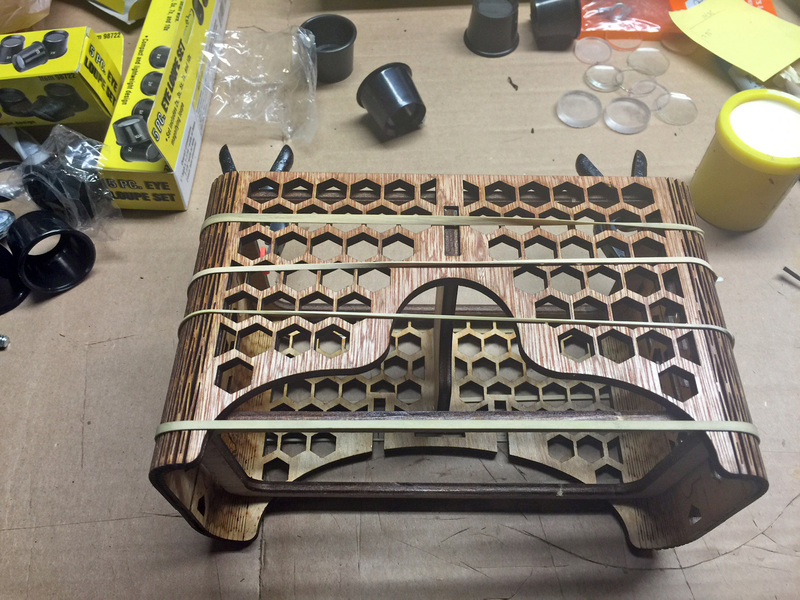 The rectangle with all the slots in it was a (successful) test of making "bendy wood." Not incorporated into the headset design at this point, just a test. 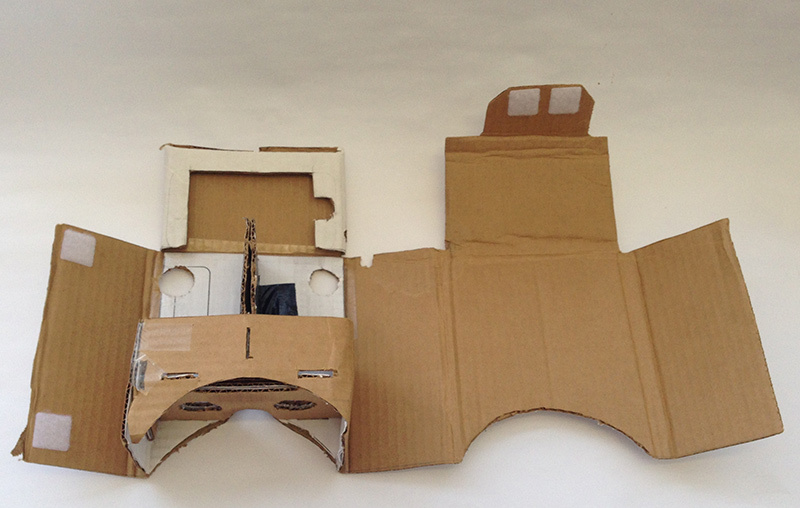 Assembled (well, held together with masking tape) plywood and cardboard goggles. 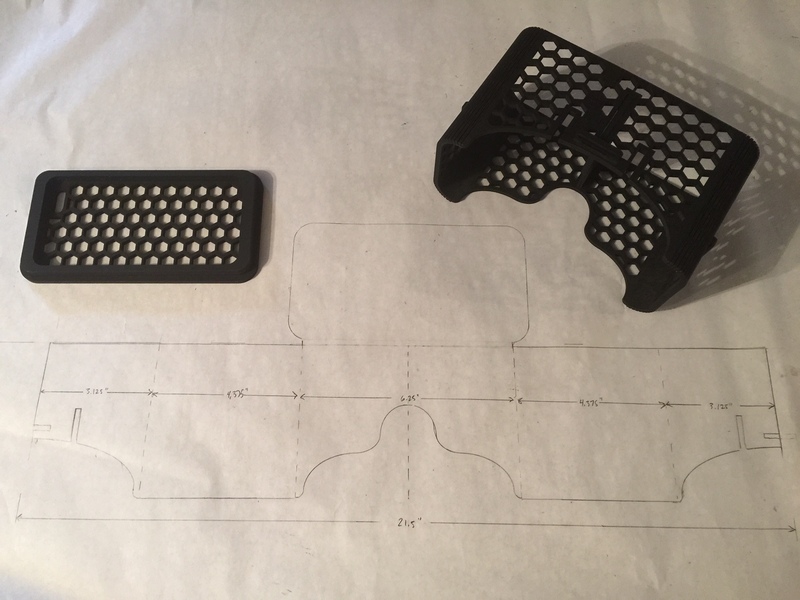 It's been a very busy month what with midterms, classes, curriculum development, and rapid prototyping with the LASER cutter, but I'm closing in on a workable design. Gluing up the first plywood prototype. The design proved quite strong, and the furniture-maker in me liked the joints, but overall it's pretty boxy and a bit heavy. Nevertheless, it was a good functional first attempt. 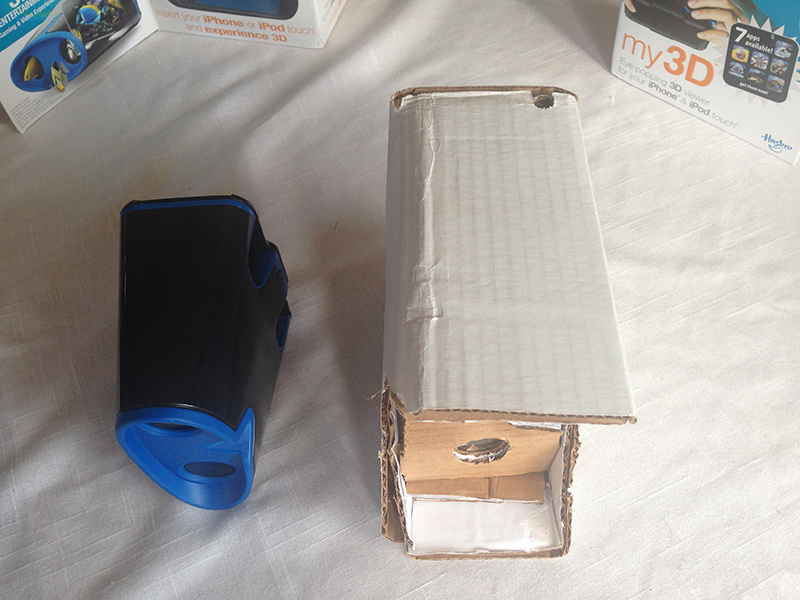 Here you can see my new lens mount design in place in the boxy prototype. 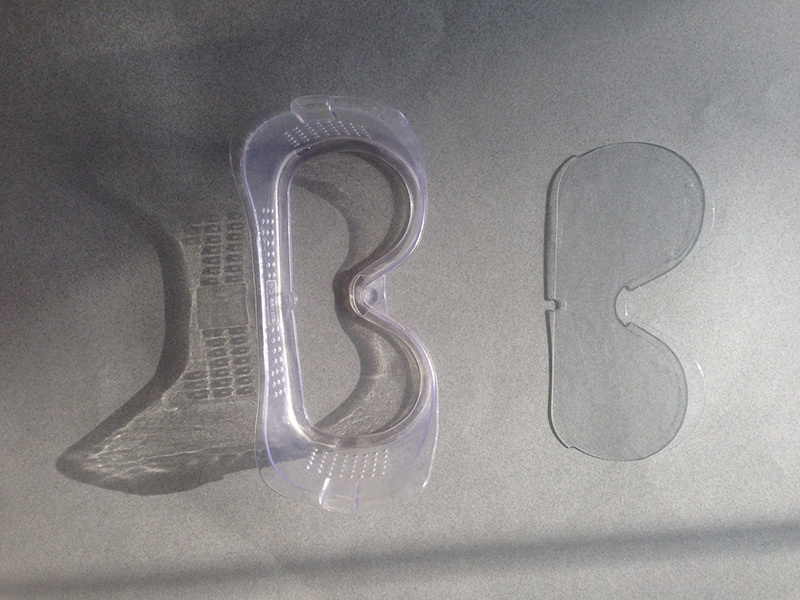 Each lens holder consists of a three layer sandwich of laser cut acrylic. The outer two layers each have a rare earth magnet glued to them and the middle layer has a hole corresponding to the magnet location so that the magnets hold the layers together. Gluing up the curved corner design. I used the phone holding frame pieces as temporary (unglued) internal supports to hold the shape while the glue set. Another view of the glued-up curved frame. Rubber bands holding the whole thing together while the glue sets. 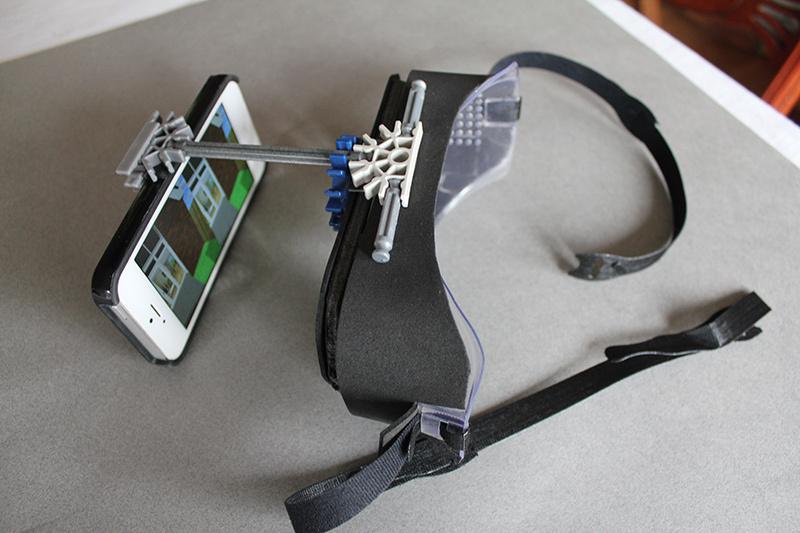 Once the glue set on the frame, I glued the two phone frames to the headset back (front?). This is also honeycombed for weight reduction. The capsule-shaped hole is for the phone's camera and flash. Curved design with the cloth covering. I used spray adhesive on the frame, then applied the cloth. 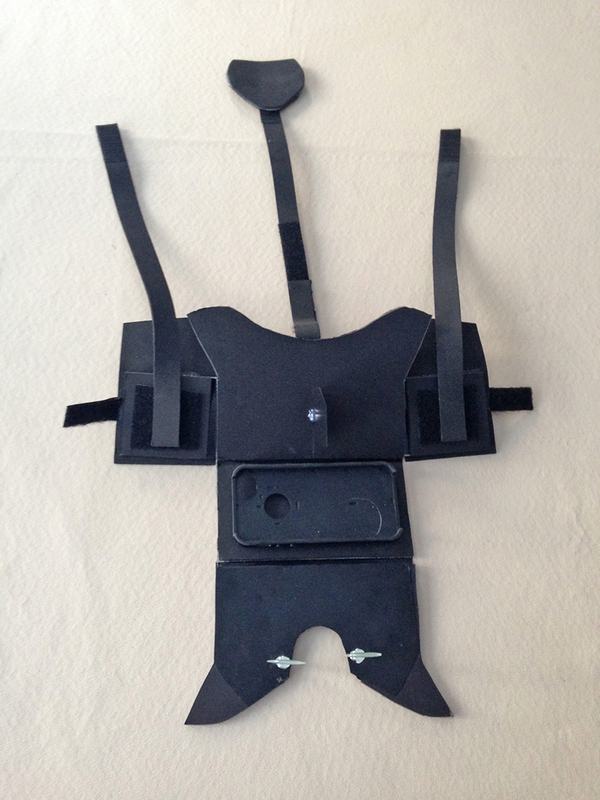 The fabric acts as a hinge to allow the headset to open for phone insertion. Two issues arose. 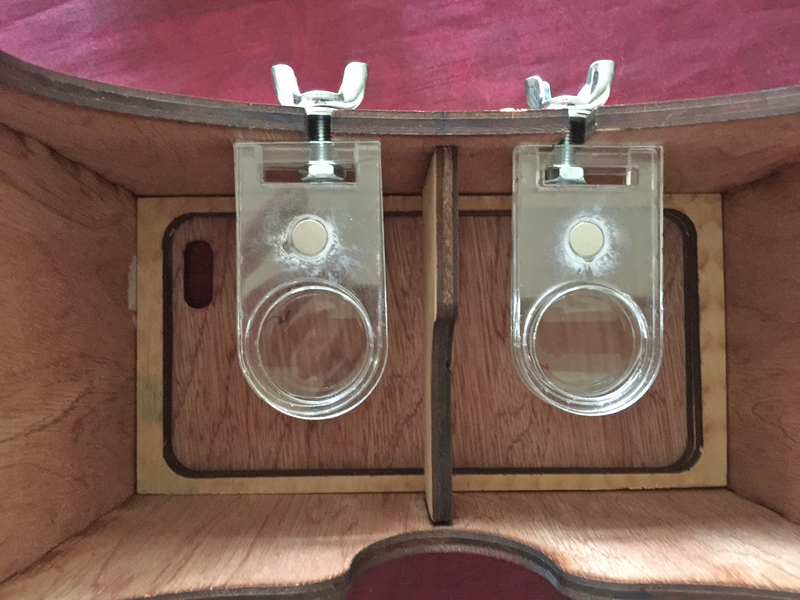 First, my measurements were off, so slots for lens mounts, etc. did not align. Second, being woven cotton fabric, the edges tend to unravel. I am going to try felt for the next attempt, as it does not unravel. Latest design revision, freshly cut. Notable changes: Combined frame into one piece to reduce gluing, re-drew honeycomb for uniform placement, fixed placement of head strap mounting slots, eliminated surplus test pieces and re-laid out components. 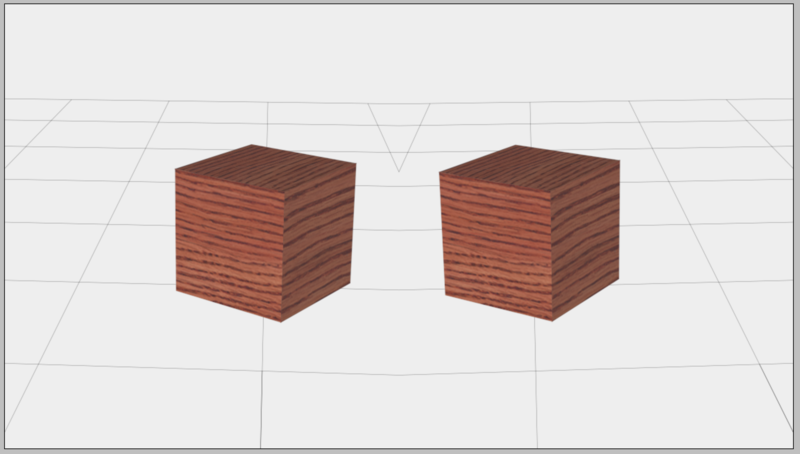 This design fits onto 9.5" x 24" piece of wood making the cost of the wood components for each headset approximately $1.25. The bulk of the assembly is in this video, however I inadvertently forgot to glue in one piece in the beginning. It was not a fatal error, and in part two I glued it in, so that you can see where it goes, but it is easier to glue in the beginning, so just be aware of that. In this part I glue in the forgotten piece, then complete assembly of the lens mounts and lens mount hardware. It's been a long road, but feeling closer to being able to use these in the classroom... well, technically I already used them in the classroom this week for a couple "show and tell" classes; they were well received. 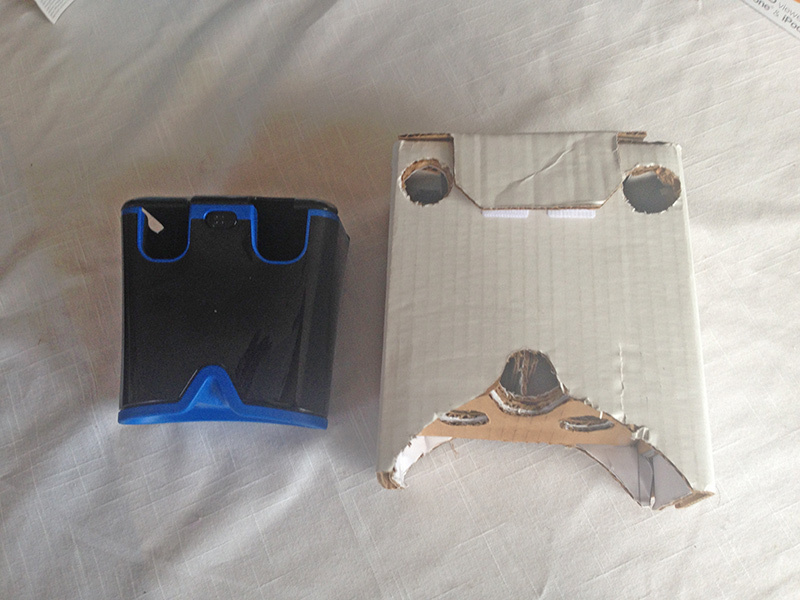 I have given kits to three faculty colleagues, so we shall hopefully see how successful they are with assembly soon. This is the headset I assembled in the videos above. Just put a light coat of flat black spray paint on it. Looks a little less steampunk and smells less of burnt wood. 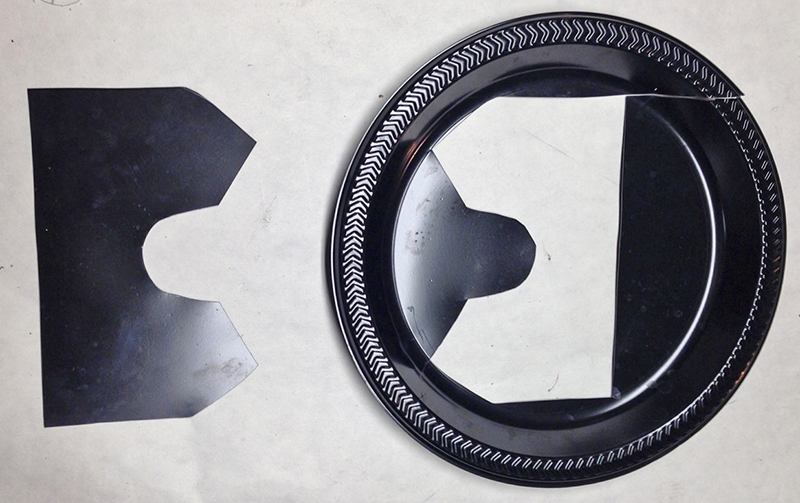 Traced and measured assembled headset to make a new pattern for fabric cover. 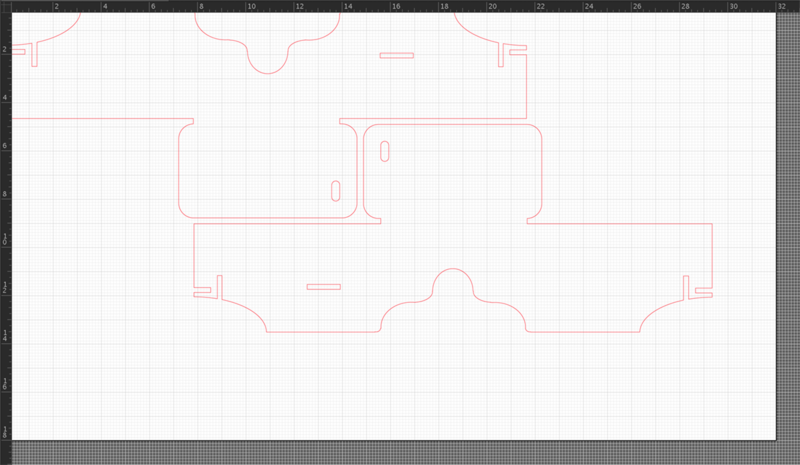 Using the tracing and measurements I drew a new pattern in Illustrator for laser cutting the fabric cover. 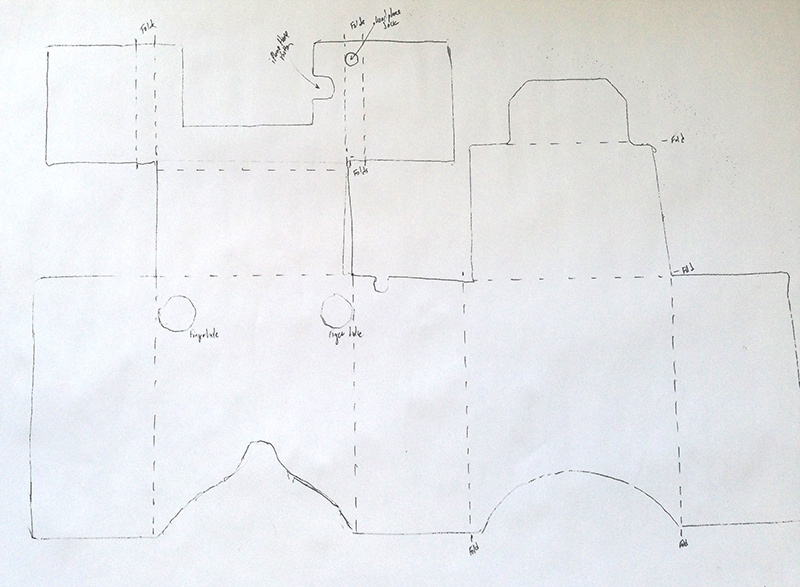 (Duplicated and rotated so as to cut two at a time and make more efficient use of the fabric.) After working with the cotton fabric on the last prototype, I switched to a knit fabric this time. It doesn't unravel at the edges and is a little stretchy, making it easier to fit when gluing on. 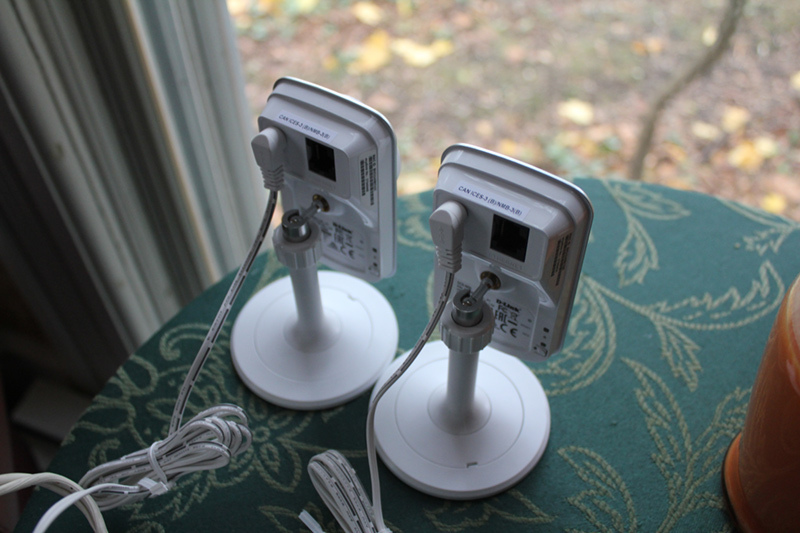 This week I obtained a pair of inexpensive IP Cameras (Dlink DCS-933L). After some web research, poking at the cameras with browser and terminal, and some packet sniffing I identified the URLs for fetching video from the cameras. So far I can only figure out how to access the MJPEG (Motion JPEG) streams. There is a "raw" H.264 stream available but I haven't figured out how to embed it into a web page, so no audio yet. Here are the two MJPEG streams side-by-side in a simple web page (screen capture on my Mac). Well, really more a "To Explore" list. Or "Possible Student Projects" list. Some are big, some are small, some I don't know. Some IP Cameras can be remotely moved. Can we tie this movement to head tracking? Need to start designing/building a server intermediary between IP cameras and headset that goes beyond a simple web page. Security, routers, dynamic dns, etc. Positional Tracking? The IP cameras I purchased have IR capability, so an alternative to using them for remote viewing is to aim them at headset user and use them for positional tracking. Do we reflect their IR lights? Put IR LEDs on the headset/person? use Phone's camera and/or flash somehow? Something else? Kinnect? Need to work on head strap design. 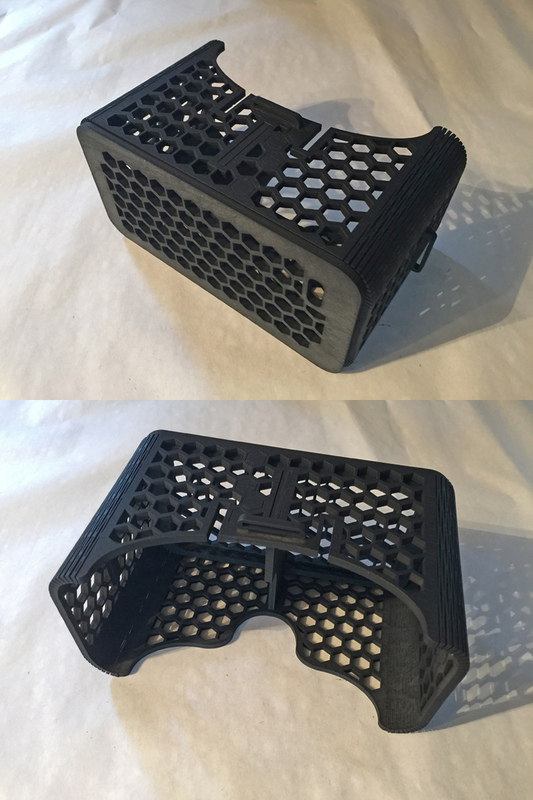 √ Acrylic spacers for single lens use. Made some and tested them. They make a big difference over the black spacers that come with the lenses. These'll be a standard part of the kits now. Wander around a virtual dinosaur park. Head tracking and 3D rendering. Take a virtual tour of a virtual house. Head tracking and 3D rendering. Nicely executed demo. 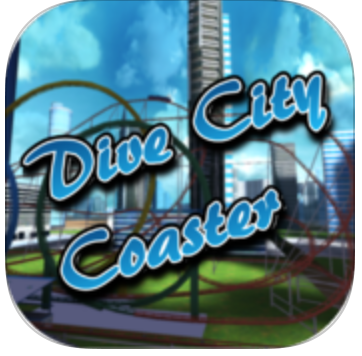 Take a virtual ride on a virtual roller coaster. Head tracking and 3D rendering. Nicely executed demo. © 2014-2016 by Ronald P. Vullo, Ph.D.